$759.99 & FREE Shipping on orders over $59. 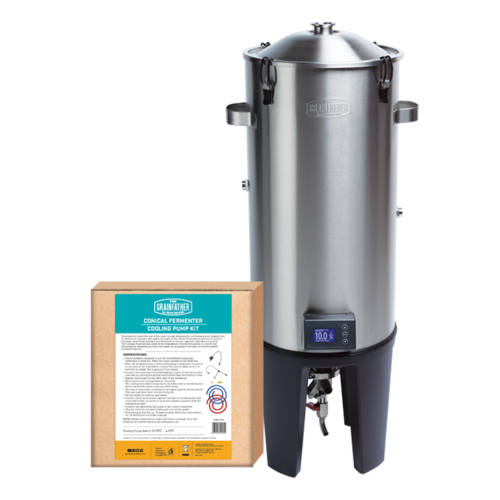 Temperature control has been well documented as an essential part of the fermentation process, and the Grainfather Pro Edition Conical turns this critical stage into a leisurely enterprise. Not only can you adjust the temperature with the push of a button, the Temperature Controller on the Pro Edition can be programed with up to four unique schedules, so you don't have to remember to step up the temp on days 3 and 5. Set it, and forget it! Integrated Cooling Sleeve: In between the two stainless steel walls sits a cooling sleeve (also made of stainless steel). This cooling sleeve is welded onto the inner wall of the fermenter and can be hooked up to the Cooling Pump Kit. Temperature is dialed into the Temperature Controller and as the iced cold water travels through this sleeve, it cools the stainless steel which in turn evenly cools the beer in the fermenter. The cooling sleeve never comes into contact with the beer, it is completely concealed, built into the fermenter and never needs cleaning or sensitizing - a true innovation for a fermenter of this scale. Basic Cooling Pump Kit: The Cooling Pump Kit allows users of the Grainfather Conical Fermenter to control the fermentation temperature with cold water by pumping it through the double walled insulated interior. Temperature Control: The Temperature Controller easily snaps on and replaces the standard Temperature Display via magnets and pogo pins. Allowing you to accurately dial in a temperature and even set a temperature schedule/profile (you can set up to 4 profiles each with 5 stages). It can control the heating of the integrated heating element and the cooling via the Cool Pump Kit. No coil needed to hold temp. in this fermenter and built-in heating element. I already own one of these fantastic fermenters, they are worth every penny. And to have them available through MoorBeer here in California with free overnight shipping was a no-brainer. Does this fermenter heat and cool the fermenting beer ? BEST ANSWER: Yes, and within a degree of whatever temperature you set. I live in the Central Valley of California where temperatures in the garage that I ferment at reach as high as 95 during the day. I've modified a 10 gallon Igloo type water cooler as my source of cooling water. This only requires exchanging jugs of ice twice a day to maintain enough chilled water. This now allows me the ability to control fermentation temperatures to the point of improving batch to batch consistency that i've been looking for. I would definitely recommend this product.